Loki shall have battle with Heimdallr, and each be the slayer of the other. Then straightway shall Surtr cast fire over the earth and burn all the world; so is said in Völuspá. –Glyfaginning (English translation) , a depiction of Ragnarok. Siege: Loki (Kieron Gillen, Jamie McKelvie) – There’s something about Kieron Gillen’s writing that reminds me of Alice Munro. I know, I shouldn’t compare one of the best living writers of short fiction to a writer who’s relatively at the beginning of his career, but here we are. They both have this uncanny ability to create fully realized and emotionally honest characters with concise prose. In a few pages, you may not know everything about the character, but you develop an instinctive understanding of the complex and contradictory stew of emotions and rationalizations that define them. The beauty of this approach is that it expands the reader’s horizons – in Phonogram: The Singles Club, one doesn’t even have to be familiar with a genre of music or a particular social/cultural scene in order to empathize with the central characters. Both writers also have an amazing ability to illuminate the mundane; to remind us of the intense paradoxes that lie at the core of seemingly ordinary things. As a writer of mainstream comic books, Gillen is able to supplement that with a Matt Fraction-like ability to generate clever premises for his books – ranging from the light/dark fantasy book about pop music, magic and obsession to a sharp satire of pop war movies filtered through the prism of a War God training an elite squad of troops. This week he brings us the story of what happens when a God of Mischief tries to escape his destiny, providing a unique insight into the nature of one of Marvel’s most interesting villains. By the end of this issue, you understand how Loki could simultaneously be the god of chaos, mischief and evil. In Comic Alliance’s roundtable review of this issue, David Uzumeri drew an analogy between this issue’s Loki and the Superman villain Mr. Mxyzptlk from the Alan Moore classic “Whatever Happened to the Man of Tomorrow?” In the climactic sequence, Mxyzptlk explained that he had spent a thousand years making mischief, and wanted to see what it would be like to be evil for a millennium. It’s a good comparison, and I would only quibble in this regard: I think Gillen’s trying to tell us that this truly dark side of Loki has always been there. The Gods (in their arrogance) always underestimated him, and never understood how much he hated them. So this isn’t about change. This is about freedom. This issue is a master class in concise storytelling. The story moves briskly with a minimum of exposition – instead of explaining Loki’s plan, Gillen gives us a ring-side seat to watch it unfold, from Loki’s perspective. By the end of the book, I felt like I was introduced to an entirely new character. It’s not just that Loki’s capable of great evil, or mayhem, but that he’s a fully realized character with some qualities that I can actually identify with. It’s hard not to admire his struggle, particularly once we know exactly what he seeks to escape. Who can’t find something to admire in a quest for freedom? Gillen and his frequent artistic collaborator McKelvie find interesting ways to collapse the distance between Loki and the reader throughout the issue. Loki frequently turns to look directly at the reader, implicating us in his many deceptions, and the whole story is told from his perspective, further encouraging our emotional engagement. Gillen deftly incorporates behind-the-scenes details and insight into events from Siege, the New Mutants tie-in, and Thor without overburdening the story with continuity. His fresh though brief takes on classic Marvel villains Mephisto and Dr. Doom and assorted Asgardian gods contributed to a really fun read. McKelvie continues to be one of the most underrated artists in the business, and turns in some beautiful work. 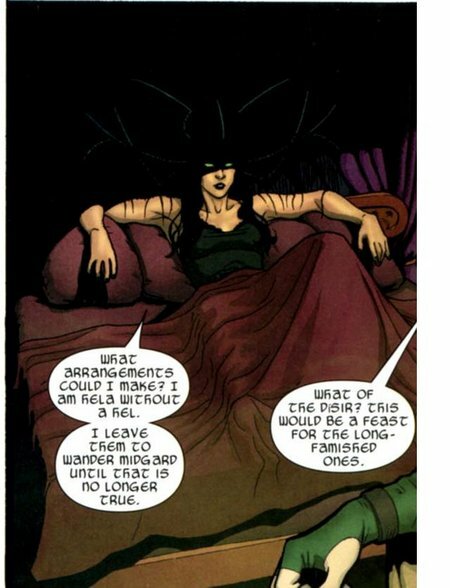 I also kind of love the debased rock star undercurrent throughout the issue, whether seen through McKelvie’s portrayal of Loki, or in his hilarious take on Hela. One thing I wondered about at the end of this book is whether Loki actually achieved his goal. He’s free. Free to…. terrorize Asgard, battle his hated enemy, and lose. Loki is still Loki. A fictional character who can’t escape the trappings of the narrative. He will overreach, because that’s what he does. Daytripper #5 (of 10) Fabio Moon, Gabriel Ba) This is a wonderful book that exceeds my expectations every month. 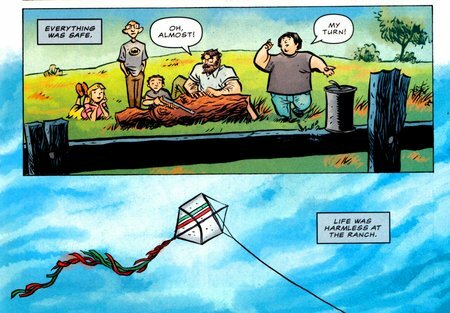 For the uninitiated, Daytripper is a laconically paced post-modern fable about one man’s journey in life. Each issue takes place over a short period — ranging from a single day to about a week — in a single year of a man named Bras’s life and focuses on a moment that helped define him as a person. In the first four issues, we’ve seen Bras reconcile himself to his father’s legacy, experience the birth of his first child and consummate a passionate love affair. One real risk of a story like this is that the plot can feel overly familiar; nearly every issue fits neatly into an established archetype. Moon’s lyrical and emotionally honest storytelling more than compensates for any cliches. This issue, entitled ’11’, explores Bras’s childhood, and is set during a weekend visit to his grandmother’s house in the country. We see how Bras’s early relationship with his family shaped the man we’ve come to know in the first four issues. Moon briefly shows us the roots of Bras’s issues with his dad, who is portrayed as a man struggling (unsuccessfully?) to maintain a balance between his responsibilities as a father and his needs as a writer. For the second time in the series, we’re taken out to the country, which gives Ba the opportunity to let loose with his inventive visual style – portraying the natural world plays to his strengths as an artist. Ba evokes a sense of wonder and joy with this issue, reminding me of what it was like to be eleven and playing made-up games with my cousins. Dave Stewart is the colorist here, and he gives Ba’s art a painterly quality that contributes to the nostalgic vibe of this issue. Justice League of America v2 #44 (James Robinson, Mark Bagley) – If you had told me fifteen years ago that Robinson and Bagley would be the creative team on Justice League, I would have been intrigued. I loved Robinson’s work on DC’s Starman, the Golden Age miniseries and Firearm. Bagley’s work on New Warriors and the Amazing Spider Man was a fresh alternative to the over-rendered style that was popular in superhero books of that era. I haven’t followed the careers of either creator very closely over the last decade, but Robinson’s work on Superman, Batman and the Cry for Justice miniseries was incredibly disappointing. So when I was told that this issue of Justice League was pretty decent, I decided to check it out. The verdict – it’s readable, if not a return to form. Robinson gives us a more vulnerable and tentative Justice League filled with characters who are trying to figure out their role in society (Congorilla, Starman?) or are trying to follow in the footsteps of their mentors (Batman, Donna Troy). In this issue, which is a tie-in to Brightest Day, the team investigates a mysterious asteroid strike and confronts Etrigan. This is a pretty standard superhero story that makes some efforts to explore the team dynamic. It’s not bad at all, but I still wish that Robinson would write books that play to his strengths as a writer. Bagley does a nice job, but isn’t asked to do anything particularly interesting. Blue Cheese Scallion Drop Biscuits ! Does Tom Hanks exist in Tom Hanks movies?